Happy Friday! I can't believe another weekend is upon us! Already. It feels like the week was just getting started :) What's it going to be like once my littles are in school?! Do you have a recipe that you make so often, you have it memorized? I really enjoy trying new recipes, so I tend to make ALOT of new recipes, especially for dinner and baking sweet things. I get rather bored with the same dinners over and over. Same with sweet treats, there are so many delicious recipes out there, I just want to try them all! But when it comes to breakfast and lunch, I tend to eat the SAME things. And I don't get tired of them :) Maybe that's why I like to change it up so much with dinner and snacks! So for breakfast, I eat this granola, every. day. And I love it!! I've figured out exactly the combination I like the best, how "baked" I like it, everything. This is probably my most repeated recipe, I make it about once every week & a half, sometimes more often, depending on how much the rest of my family eats it too. Therefore it is my favorite memorized one as well :) I love being able to just pull out ingredients, measure, dump and mix, without looking at a sheet of paper for every step. It's delicious! Hope you try it. And it pairs REALLY well with this Crockpot Greek Yogurt too! And I forgot to mention, this comes together really fast, and then you just enjoy your house smelling AWESOME for a few hours while stirring occasionally! My breakfast every morning. Really, every. morning. If fruit is in season I add it, if not, I just have it plain. This is another fabulous way to enjoy it. Greek yogurt, drizzle of honey, frozen blueberries. YUM! First, spray the crockpot with non-stick cooking spray. Dump all of the dry ingredients into the crockpot. Next, in a microwave safe bowl, combine the oil, honey & vanilla. Here's a tip: When measuring out oil & honey. Measure out the oil first. And the honey will just glide out! :) No sticky mess. This is what my measuring cup looked like, no scraping at all! Lastly, add the vanilla and pop the bowl into the microwave for 1.5 minutes. While the wet ingredients are melting together in the microwave, mix the dry ingredients until well combined. Then add the hot oil, honey & vanilla mixture. Stir again until evenly coated. Then let it hang out in your crockpot for 3 hours on low. Make sure to keep the wooden spoon in there to crack the lid, otherwise the granola will not "bake" properly. Stir every 20 to 30 minutes for 3 hours, until it is evenly golden brown. 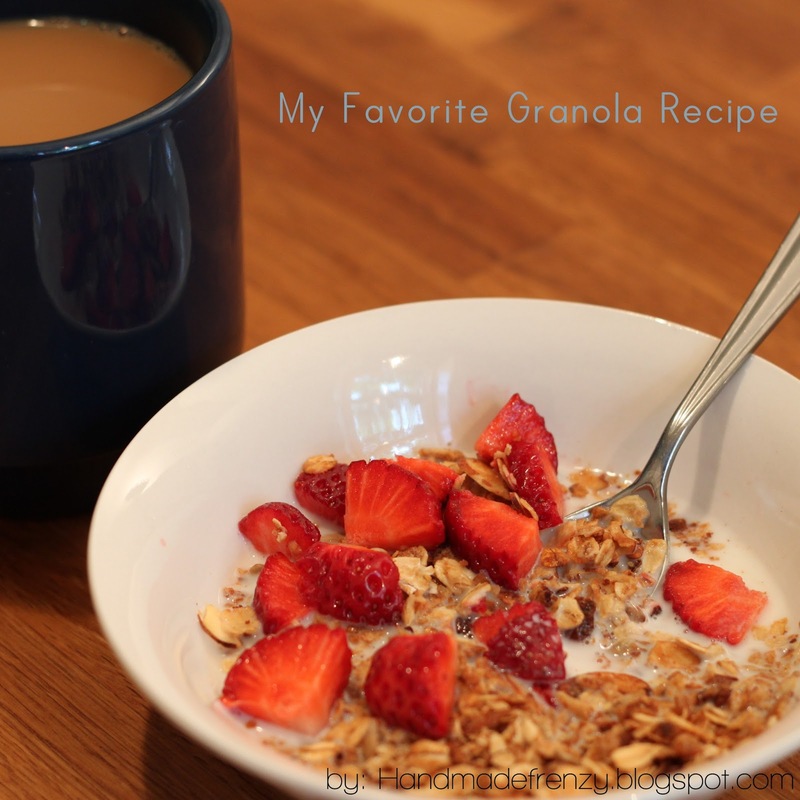 Then enjoy that yummy granola any way you like! Spray crockpot with non-stick cooking spray. Combine dry ingredients in crockpot. Mix well to combine. Combine oil, honey and vanilla in microwave safe bowl. Microwave for 1.5 minutes. Pour over dry ingredients. Stir everything together until well combined, and dry ingredients are evenly coated. Cover crockpot with lid, leaving the lid cracked with a wooden spoon. Bake on low for 3 hours, stirring every 20 to 30 minutes. Enjoy!